Moist gluten free cranberry bread with orange, white chocolate, and hazelnuts is the ultimate holiday quick bread! Dairy free option. 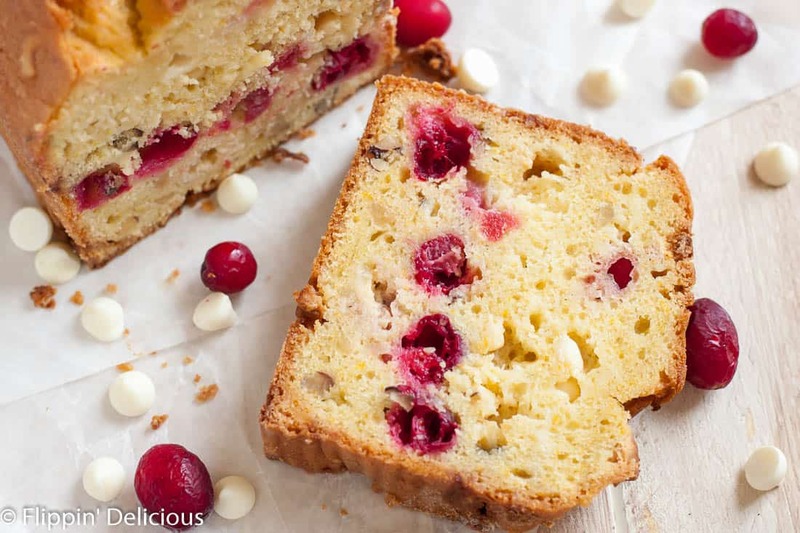 What beats a thick slice of moist gluten free quick bread studded with goodies like hazelnuts, cranberries, and white chocolate? 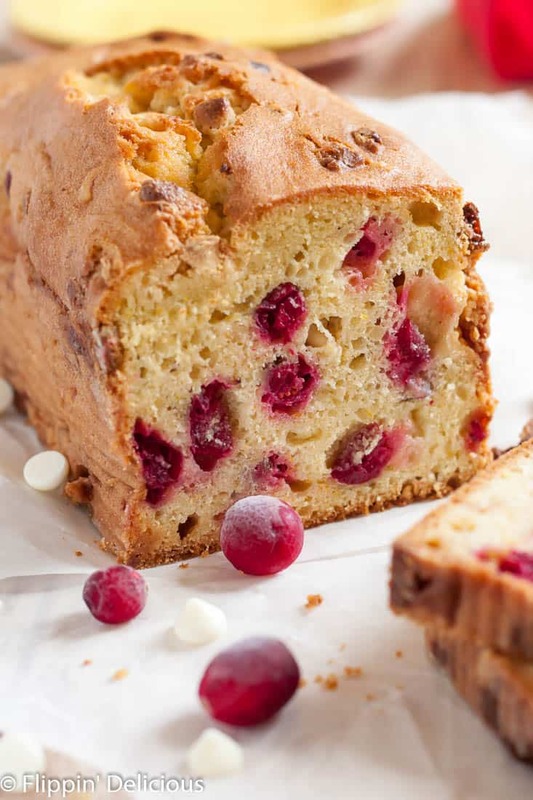 Having a slice of that gluten free cranberry bread with orange, white chocolate, and hazelnuts with a warm cup of coffee or hot chocolate. There really is no better way to start a chilly morning, especially if you add some fuzzy socks and robe to the mix. Around the holidays, breakfast is one of my favorite meals. I love warming up with a steaming cup laced with dairy free chocolate peppermint creamer and a warm slice of gluten free eggnog bread pudding with bourbon caramel sauce. Or maybe a gluten free pumpkin chocolate chip muffin or gluten free blueberry streusel muffin. 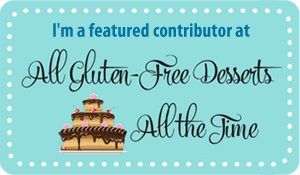 I love getting emails from readers asking for my help in re-creating their favorite recipes to make them gluten free. 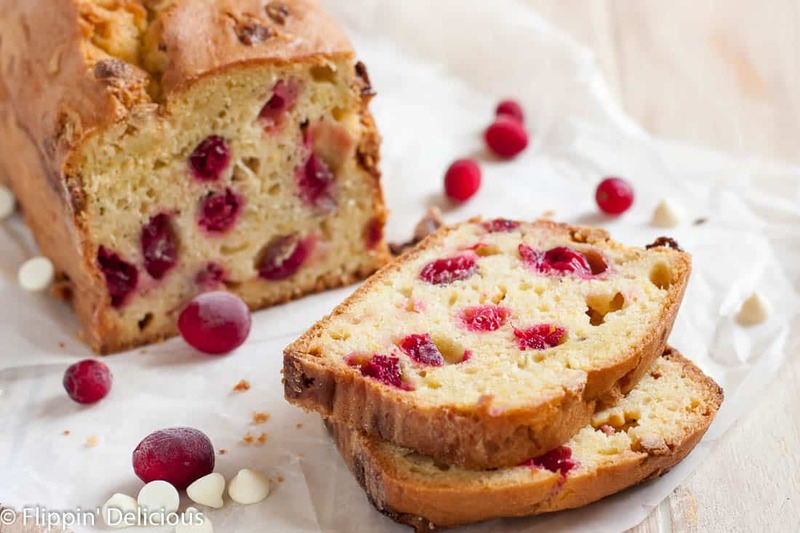 Sheree B. , emailed me and asked me if I could make a gluten free version of her favorite white chocolate cranberry bread. What better holiday recipe to bake for my family? So I made a gluten free cranberry quick bread loaf inspired by the recipe that Sheree sent me. I didn’t want to make the batter based on melted white chocolate (like the original recipe) because that would make it a lot harder to bake the recipe dairy free, since my family is dairy free now too. I kept the loaf nice and moist, even without the melted white chocolate. If you are dairy free just substitute dairy free milk and dairy free chocolate chips and you’ll be all set. 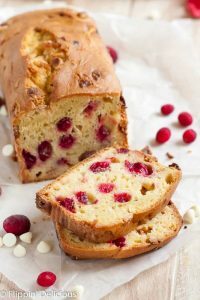 I can’t wait to make this gluten free cranberry bread again over the holidays using dairy free ingredients so that my entire family can enjoy it! 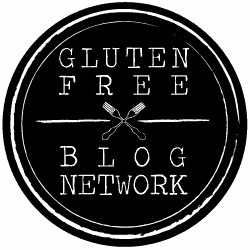 When I first opened the oven to take out the golden gluten free quick bread the fragrance of orange zest and sweet white chocolate wafted to my nose. Waiting for it to be cool enough to slice through the golden crust was almost torture! My patience was rewarded though, each bite had the nutty crunch of hazelnuts and the tart cranberry juices burst in my mouth. Whisk together the gluten-free flour, baking powder, baking soda, and salt in a bowl and set aside. In a stand mixer, or in a bowl with heavy-duty electric beaters, cream together the butter and sugar until fluffy. Add the eggs one at a time, beating until smooth after each egg. Add the vanilla and orange zest. Add the orange juice and buttermilk and mix until combined. 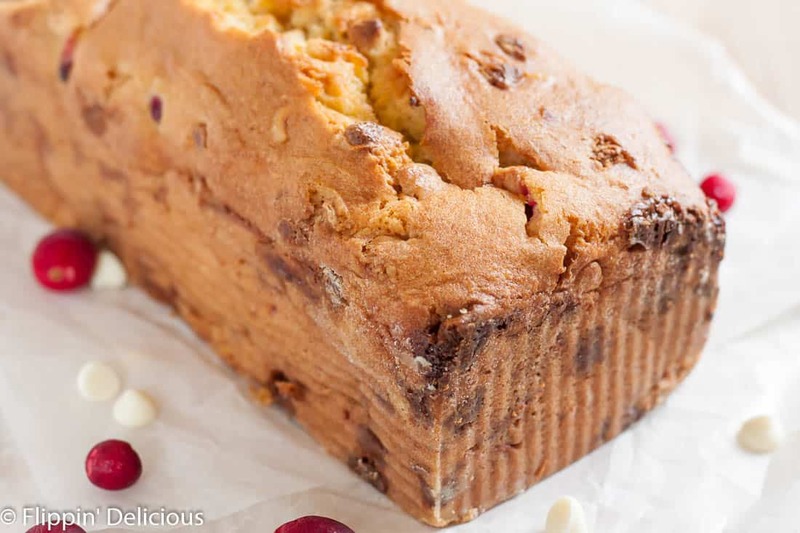 Fold in the cranberries, chocolate chips, and hazelnuts. Pour the batter into the prepared 9x4 loaf pan and bake for approx 75 minutes, or until a toothpick inserted near the center of the loaf comes out clean OR the bread springs back when lightly touched. Look at those cranberries and that perfect loaf! I’m not the breadmaker, the hubby is other than banana breads, but I’m going to have to make this! Thanks Sarah! I hope that you and your hubby enjoy this loaf. This sounds amazing! I love cranberry and often forget about it. This sounds like the perfect way to use them! Thanks Emily! I always forget to use my cranberries too. I stock up every winter, and then still have bags in the freezer when they come in season the next year. this loaf of bread is so BEAUTIFUL!! 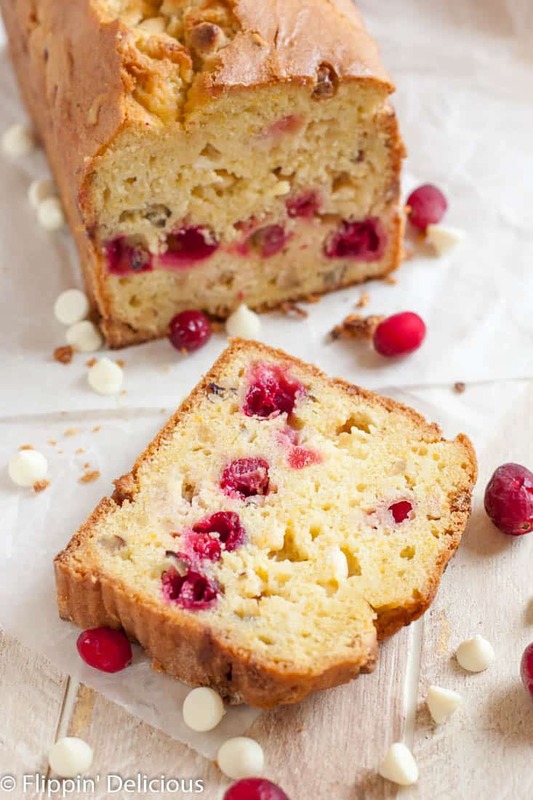 love the combination of white chocolate, orange and cranberries. Thanks Sarah! I love that flavor combo so much. I am tempted to use it in muffins, cookies, cupcakes and scones too! If you ever find a good white chocolate chip that is dairy-free let me know. I long for white chocolate around the holidays. This would make such a great neighbor gift! I have heard that Pascha has dairy free white chocolate chips. Have you tried them? They are on my list to try. I think this bread would be pretty spectacular with dairy free dark chocolate too. Or just skip the chocolate all-together. I LOVE the flavor combo in this bread!